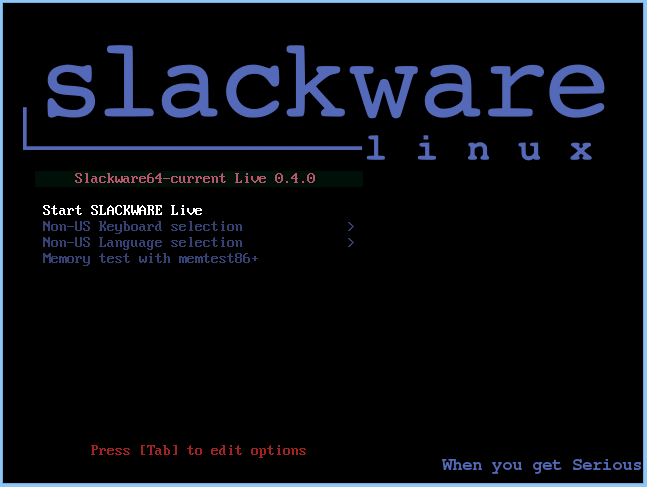 Alien Pastures » Slackware Live Edition – on its way to 1.0? 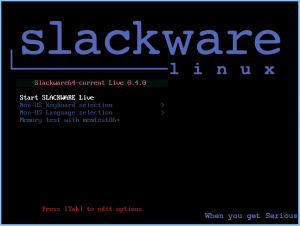 Slackware Live Edition – on its way to 1.0? Check out my previous articles about Beta1 Beta2 Beta3 and Beta4 releases for these scripts, they contain a lot of background about the reasons for creating “yet another” Live version of Slackware. The articles contain instructions on the use of the Live ISO images and their boot parameters and I am not going to repeat all of them here. My releases are meant to accomplish something I think is essential to my Live Edition. When I reach 1.0 it means that no essential functionality is missing, and that the features I am going to add later on are “nice to have”. I think that that liveslak is mostly complete at this point, but it is lacking proper documentation – the last thing to do before 1.0. One of the essential properties of the USB variant of a Live Distribution is that it should be able to store your changes and make them persistent across reboots. In the 0.4.0 release, I added a LUKS encrypted homedirectory and earlier on, I implemented OS persistence by writing changes to a directory “persistence” in the root of the Linux partition of the Live USB drive. Some people will rather want to be able to use a FAT/NTFS formatted USB stick because that allows them easier data transfers to and from non-Linux computers. So my Beta5 adds an alternative persistence method: writing the changes to a loop-mounted container file instead. That file is called “persistence.img” and should be in the root of the Live partition. The “iso2usb.sh” script takes care of creating the persistence and LUKS container files, the process of transforming the ISO into a practical USB Live OS is straight-forward and simple. Adding my Slackware Live Edition to a FAT formatted drive is an exercise I will leave to the reader, but in theory this should now be possible. The Compose Key for german keyboards is now Scroll Lock instead of Right-Alt (aka Alt-Gr). A “toram” boot parameter allows you to run the Live OS completely in RAM (you can remove the bootable Live medium after boot). A “blacklist” parameter allows you to blacklist kernel module(s) that prevent a properly functioning environment (like “nouveau” does with some new hardware). The XDM graphical login for the XFCE variant was extended with a “console” button which allows you to effortlessly drop to a console (runlevel 3). I have created ISO images for the SLACKWARE, XFCE, PLASMA5 and MATE flavours using the latest Slackware64-current packages available today (Slackware 14.2 Beta 2). Please allow some time to synchronize these mirror servers. How to create a persistent USB stick from the ISO? The ISO can be burnt to a DVD or copied to USB stick using ‘dd’ or just plain ‘cp’, but that will give you a read-only medium because all changes to the Live OS are in fact written to your computer’s RAM. Use the ‘iso2usb.sh‘ script to create a Live OS on the USB device with persistence. … where /dev/sdX is the device name of your USB stick. Note that your USB stick will get formatted – erasing all data currently stored on it. The iso2usb.sh script will pause to show you the characteristics of the target device and ask you once more if you really want to continue erasing it. You will not easily destroy your hard drive unless you are really not paying attention! How to create the LUKS encrypted homedirectory container? The iso2usb.sh script has a parameter “-c” which takes a size argument. If you want to create a 400 MB container file to hide your homedirectory in, then you need to specify “-c 400M”. 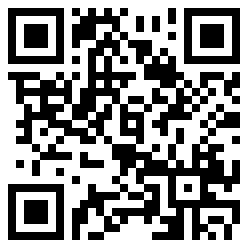 If you want 2.5 GB for your homedirectory, use “-c 2.5G”. If you are not concerned so much with the exact size but want to allocate a percentage of the free space on the stick, then use “-c 40%” to create a LUKS container that uses 40% of the available free space. When the script gets to the point where it creates the LUKS container file, it will prompt you for a passphrase which will be used for encrypting and decrypting the container’s data. Right after that, the script will prompt you to enter that passphrase again when the LUKS container is unlocked and the ISO’s /home content is copied into the container. You can select a keyboard mapping that matches your computer’s. And/or boot Slackware in another language than US English. You will probably want to change the timezone; syslinux allows you to edit the boot commandline by pressing <TAB> because the syslinux bootmenu does not offer you a selection of timezones. Editing a Grub menu is possible by pressing the ‘e’ key. After making your changes to the boot commandline, press <F10> to boot. Another difference between Syslinux and Grub menus: in Grub you select keyboard, language and/or timezone and you’ll return to the main menu every time. You still have to select “Start Slackware Live” to boot. In the Syslinux menu, only the keyboard selection menu will return you to (apparently bot not actually) the same main menu. The non-US language selection will boot you into Slackware Live immediately without returning to the main menu. A limitation of syslinux. Posted: 6 February, 2016 in Me, Slackware, Software. Good work , i post a little problem with als-to-pulse redirect in LQ-Forum ,think you interesting in read. Not tried it myself yet but it sounds like a good thing to have. Same as cd/dvd , think users running directly *iso in virtual machines… ever first run. toram doesn’t work too well here (I tried with 4GB of RAM), it just says few times that no space is left on the device and fails to load SDDM. Also performance is much worse comparing to beta3 (I haven’t tried beta4 so can’t say if it was the same), cursor has it’s own life, it follows movements after a short while, and slows down more often. Is there a way to setup ALSA as an output for Firefox? Because the sound quality with PA is even worse than I feared. Grummer… yeah I slipped there. Pi, adding “toram” was only added to please certain complaining users.I do not consider it useful except when booting the XFCE ISO. The rest of the variants are just too big to make copying to RAM useful. A modification to that command needs to be added to the liveinit if someone tries to use “toram”. As for perceived speed and issues with pulseaudio – that is not what this blog article is for. Those are Slackware related issues and you should discuss these things in the LQ forum for instance. There you will find information from other users who attribute the slowness to the 4.4.1 kernel (Beta3 still had a 4.1.15 kernel). There is a lot of discussion on LQ – with example code – for PA sound issues. rel, this is not Ubuntu. You should not use sudo that way because in Slackware, you will then miss /sbin and /usr/sbin from your $PATH. Which is why losetup (and other critical tools for root) are not found. Become real root and run the script. Thanks Eric – I gave up Ubuntu a year ago to move over here – some habits die hard. I’ll try again. I appreciate the response. Raveriux – no plans for that. I don’t even have a package for that. And it is not in Slackware either. Thanks a lot Eric for these LIVE editions ! on this USB stick ! Marvelous this new Plasma desktop ! if my KDE environment was broken. I have copied a .kde directory I had on a separate disc and rebooted. Everething is now again good. But if I want to test more your LIVE versions I will first save my .kde directory ! Désidérius I wonder what you did then. When you boot a Live USB stick on a computer, its hard disk will not even be touched. I used a USB stick with Plasma 5 Live several times on my desktop (running Slackware64-current with KDE4) and my laptop (slackware64-current with Plasma5) and never had any issue. Eric – are there any plans to include a hard drive installer that can be run in the live session? rel, not soon. It is rather a lot of work to write a harddisk installer which is reliable. I see “cxxlibs” is still in the min.lst but I thought it has been remove. So what is up with that? Cxxlibs has been removed in -current, so it will not get installed when you generate the XFCE ISO. The fact that it is in the “min” list does not hurt a bit, you will just get a notification that that package was not found and then the process continues. Thanks for all of this work, AlienBob. I will use your scripts as a base to create a LiveCD for Cinelerra-CV. Schmatzler, I will upload the README which I have been writing tonight (to the git repository at least) so you can have a look and then tell me what you are missing. If it is technical info you are missing, try to be specific in what you need so that i can write it down as separate sections or additions to existing ones. Thanks AlienBob, I’ve already created a live .iso but it doesn’t boot completely. Basically, I didn’t do that much. Everything else is still set on the defaults. Afterwards I created cinelerra.conf and cinelerra.lst in /pkglists with a list of my packages and ran the script. Afterwards it’s just errors about /etc and /var missing. Maybe you have an idea why that happens? I know what happened Schmatzler. You used a git checkout which contains an untested commit… and as it goes with untested stuff, it breaks your computer. I really like these scripts. The modular design is easy and I figured out quickly what I need to do to create my own ISO image. By the way, if ther is going to be a permament public repository for Cinnerella which targets slackware64-current (and later on, Slackware 14.2) I can add your cinelerra.conf and cinelerra.lst to my scripts so that you do not have to maintain them. Yes, we will have a public repository for our packages, it’ll take some time, though. A lot of stuff has to be built which is not yet available in Slackware. 1. What do you think about adding virtualbox-addons and virtualbox-kernel-addons? Those greatly improve the live system by enabling shared clipboard functionality and dynamic resolution in VirtualBox. Without it, the system runs on 1024×768 and I have to scroll on my 720p monitor to see everything on the screen. 2. Having a more modular skel system would be nice. We will add some application presets for video conversion, which I’d have to include into the existing skel.txz. Makes it harder to adjust when you change the skel.txz. A way to add our own custom skel.txz in addition to the existing one would be very useful. The virtualbox stuff I will leave to you: you can create module(s) and add those to the “addon/” subdirectory when you generate the ISO. I am not focusing on virtualization environments for now. The “skel.txz” file, that one needs some explaining. At first I wanted this to be just a directory tree in my liveslak directory but some of the directories have nonstandard permissions, making them inaccessible for other user accounts. So I decided on archiving all of it into a single tarball that can be extracted while generating the ISO. What I can do is enhance the “make_slackware_live.sh” script to pick up _all_ files called skel*.txz in the skel/ subdirectory. That way you can add your own set of files in a “skel_cinelerra.txz” file and its content will be added to the ISO automatically. Schmatzler, you will probably find the recent git commits useful for your purpose. I will adapt my scripts to the custom LIVEDE features soon. Yesterday I built a first public .iso and had people test it. Some reported that the username field was invisible on the login screen. They where still able to login, just couldn’t see it. Have you heard of that before? I couldn’t reproduce it, but two different people had the problem. rsync -aPSH –delete –exclude “*-iso/” –exclude “source” rsync://mirrors.kernel.org/slackware/slackware64-current . After putting all of my changes into the make_slackware_live.conf, the script wouldn’t find my slackware repo anymore. Schmatzler, an untested piece of code 😉 I will update the script tonight after some testing. I do not want rsync downloads of the Slackware repository, that one should be available in advance. The rsync should only trigger for absent mirrors of 3rd party repositories. Hi ikke, the “lowriter” program of libreoffice-5.1.0 works without error on the Plasma5 Live version I built last weekend… which is a full install of Slackware minus KDE. What Desktop Environment are you running this on? How would one go about replacing the default kernel in the live iso? Thanks in advance!!! Thank you very much for prompt reaction. Sorry : I forgot to mention that I have been using xfce4 “slackware64-live-xfce-current.iso” 0.5.1. Have been looking around on internet but didn’t find a solution. ikke, I built libreoffice on a full installation of Slackware. The XFCE Live variant is a severely stripped version of Slackware so you are probably missing one or more libraries. This is not something I will support to solve. okibi – that will be an exercise I will leave up to you to find out. – replace the “boot/generic” file with your custom kernel; leave the filename unchanged. Hello alienbob, Nice work again. I’m Just downloading the .iso image now, but I want to ask you if the “Non-US any* selection” is a persistent choice in a usb stick. Thanks one more time. gorson, persistence is limited to the operation of the OS. It is not possible to make the syslinux boot selection persistent across reboots but you can of course edit the syslinux menu file(s) on the USB stick yourself, and configure your own defaults. I don’t have to do anything with the included kernel-huge or the kernel-modules packages? And if my kernel includes all the built-in drivers, can I just ignore doing anything with initrd.img? okibi – that is why I said ” that will be an exercise I will leave up to you to find out”. If you compile a custom kernel with a different version you will have to update the modules in the initrd (unless as you say your kernel has everything built-in). You also have to update the kernel-modules in the Squashfs module “0010-slackware_a-current-x86_64.sxz”. Maybe more, but that is the minimum you need to do. Thanks for sharing liveslak. I put the Plasma5 variant with iso2usb.sh on an USB-Stick. Is it already documented how to build customized modules (I want to use Matlab and LabVIEW this way)? Thanks for the reply. One small thing I recognized when booting liveslak: If I choose german keyboard layout (but english language) and open a konsole afterwards, it is not possible to enter the characters @ ( ) or | ( <>. German Umlauts seem to work. What am I doing wrong? No idea ahz – I do not own a german keyboard so I implemented the feedback of one of your fellow german keyboard users. I tried to set the pc105 keyboard and the “eliminate dead keys” option explicitly within the Live System (by clicking on the language symbol in the footer). But this didn’t change anything. alienbob. I tried to run plasma version in virtualbox and an error message “VERR_NOT_SUPPORTED)” when I try to select the iso image. I installed cdemu and tried to load the iso image on the virtual drive but it show me error to. I checked the md5 sum and is good. I downloaded the xfce version too and this image load successful in virtualbox and cdemu. ahz, the piece I was most interested in (the virtual console keymap) is not shown by systemd. You posted “VC Keymap: n/a”. gorson I am not a virtualbox support person, you have to look somewhere else to get answers to your question. There is no difference between the XFCE and PLASMA5 variants on an OS level and also the syslinux/grub boot configurations are identical. The only difference would be the support of accelerated graphics. When you google for “verr_not_supported” most issues seem to be caused by corrupted ISO images though. Any ideas which libraries are missing so I could use Libreoffice? alienbob That is I said the both program seems to have problem with the iso file is not a virtualization thing, but I checked the md5sum And my iso file is the same that you host. ikke, I guess you need to run “ldd” on the binaries contained in the libreoffice package to find out. I just got the latest current of your Slacklive and it’s running fast and furious…had some trouble with sound, but it’s fixed now (with help from a few folk on LQ). Got a question about nvidia drivers. Is it possible to use/install the nvidia driver blob from nvidia’s site during bootup of my usb stick liveslak? The nouveau drivers just don’t quite do it and scrolling gives breaks and lines all over teh screen and extremely slow (might as well be ‘system frozen’) movie playing. Thanks for any insight on this and thanks for the work you’re putting into LiveSlak. So far of the 5 or 6 ‘live’ distro’s I’ve been playing around with, your LiveSlak and Puppy’s ‘Wary 5.5’ are the only two with ‘persistant’ usage. Copy http://slackware.uk/people/alien/liveslak/graphics/0060-nvidia-352.79_4.4.1-current-x86_64.sxz to the “/liveslak/addons/” directory of your USB stick (if you used the Plasma5 ISO then this file is already in /liveslak/optional/ so you can simply move the file from optional to addons). If you reboot the USB stick, the Nvidia 352.79 drivers will (should) automatically be used, nothing else you need to do to make it work. WOOHOO!! That worked a charm! You’re a frikkin’ genius, alienbob! I owe you a six-pack of beer! Oops…forgot one question the other day. It *is* okay to change root and user passwords (user name too), in the KDE gui kuser or whatever it is (I can’t remember at the moment), correct? Or is it not possible, especially since I have this stick with the LUKS setup you showed us how to use? Thanks again for this SlakLive. Man it’s awesome being able to showout (non-southern folk will call it showing off) to my friends just like I’m sitting at my own computer!! Grog, you can do with it whatever you like. And if you want to zap all your modifications, just delete everything in the persistence.img file (if you are using a persistence container file) or below the /persistence directory (if you are using a plain directory). Removing this content should be done while _not_ using persistence at that moment, which you can achieve by adding “luksvol= nop” to the boot command (mind the SPACE character in there!). If you are using LUKS encrypted persistence then you need to unlock the container file first before you can mount its contained filesystem and erase its content. That, too, is left as an exercise for the reader. Someone asked for a hard disk installer… it’s well underway. Next beta, will have it. Awesome, AlienBob! 🙂 I’m really looking forward to that. No idea what’s causing this. So far, two people had the problem and it worked fine for everyone else. Manpage encoding issues are seen for some languages. Hope you can help me again, AlienBob. I want to add slackpkg+ to SEQ_CUSTOM. It doesn’t seem to work, I get asked for a slackpkg+.lst in ./pkglists. If I understand the .sh file correctly, shouldn’t it look for the slackpkg+.txz in ./local64? @silius: as long as man pages will be provided in various encodings (legacy and UTF-8) this issue will remain. It only gets worst because you often have to guess the encoding, or use iconv to find out by try and fail… In the Slint project we encode all man pages to UTF-8 (and recommend e.g. to set GROFF_ENCODING to UTF8). Ideally only UTF-8 should be used… Maybe in Slackware 23? OK forget it, just my Sunday useless rant. Until you get the good one. Didier, what you describe is an issue you have with the Slackware distro itself, not with the Slackware Live Edition. I use whatever is in the Slackware distribution. You need to create a directory “./local64/slackpkg+/”. Any package in that directory will be used when supplying “local:slackpkg+” in your package sequence. Thanks! Was scratching my head on this one. Eric: yes I know, I was just in moaning mode or mood, sorry for the noise. Unfortunately I do not exactly understand what your issue is. If you use “dd” command to copy the ISO to a memory stick, you should see a boot menu before Slackware Live boots. If you do not see the boot menu but still the USB stick shows you a graphical login and you can login there and use the XFCE deskop, then I have no idea how your computer boots. When the iso2usb.sh script complains about missing mkdosfs and a missing unsquashfs, then you are not running Slackware-current. That should not be a problem as long as you install the squashfs-tools package from my repository. The “mkdosfs” program is part of the dosfstools package. Obviously you do not have a full install of Slackware. The iso2usb.sh script should do the job correctly if it finds all the required tools, even when you run the script on Slackware 14.1. Hi Eric, I saw some codes below in make_slackware_live.sh. The code will be executed correctly even with the inconsequent usage of the slash – because the whole block of script code is executed after chroot-ing to the installation directory. But I agree that it looks kind of messy and make it harder to read and understand. I will polish that bit of code which was taken from the Slackware scripts. Is there room on the live ISO for firejail? Awesome little sandboxing program that is essential for my work, and could be very interesting for others. Because mkfontscale and mkfontdir are not performed on each font directory except the misc directory, the code block discussed yesterday has been tested as followings. But it is strange to use \$fontdir instead of $fontdir. Without this correction, xlsfonts | grep adobe-helvetica does not show anything on liveslak. How do you think about this, Eric? echo "Font directory = (\$fontdir)($DBGOUT)"
rel, the only ISO where I add custom packages (i.e. not related to a specific Desktop Environment like Plasma or Mate) is the PLASMA5 ISO where I add productivity stuff like Chromium and LibreOffice. I am not sure I understand how firejail would be a worthwhile addition to that ISO. What will it allow you (and others) to do that makes it essential? After clicking on the “de”-Icon in the bottom line and selecting “Configure” you can chose the “Advance” tab. Fourth last entry here is “Position of Compose key”. In there “Right Alt” is marked (the only option which is marked there). Unmarking an applying brings @ and | to work. Furthermore I saw that in /etc/X11/xorg.conf.d/30-keyboard.conf the Option “XkbOptions” is called with the parameter “…,compose:ralt”. Maybe this causes the misbehaviour and maybe this compose:ralt-parameter is useless anyway (pr in most cases)? Any idea? As so many others have already said: Awesome! I’ve been looking for a user-friendly (for those that, like me, have limited Linux skills) Slackware distro ever since Manfred Müller was forced to give up development of his FluxFlux distro. Knowing that Eric is one of the most knowledgeable Slackware enthusiasts, this looks really promising. When the installer is ready I’ll probably take the plunge. KG Hammarlund, as far as I know Manfred was working on a FluxFlux reboot based on my liveslak scripts. Several improvements were contributed by him, to be able to create his customized Live ISO with less effort. His web site states that he is absorbed by a severe illness in his family, so I do not know when we will see a new FluxFlux release. When I try to ‘setup2hd’ on my MacBook, the installer stops around 70% with the message “Low on Disk Space”. The filesystem partition is around 450 G, so something strange is happening. This MacBook has previously had Ubuntu MATE on it, so I might have done something strange with the partitioning scheme, but have you got any thoughts? Chris, that sounds like the install is happening on the filesystem of the Live OS, i.e. in RAM. You should check your mounts, the target partition should be mounted on /setup2hd … it sounds like in your case the directory exists but nothing is mounted on it.